While Linus may wait in vain for the Great Pumpkin each year, fans of Dark Hall Mansion's Peanuts art prints have much better luck - for the fifth year in a row, they're back with two new limited edition designs based on the TV special It's the Great Pumpkin, Charlie Brown, just in time for Halloween 2015. Note that these prints go on sale Thursday, October 22, 2015 at 9:30 AM Pacific time - less than 24 hours after this is posted - so if you're interested, be ready to head over to Dark Hall Mansion's webstore as soon as possible after that time. First, there's a moody piece by Tom Doyle & Ridge Rooms, showing the aftermath of the evening. 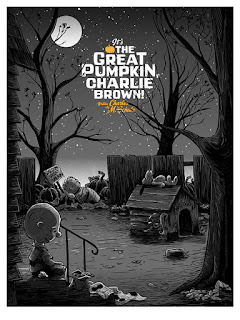 This print will be available in a standard edition, a variant edition with silver metallic ink highlights, and a small glow-in-the-dark edition. As a bonus, all editions will be signed by artist Tom Doyle. 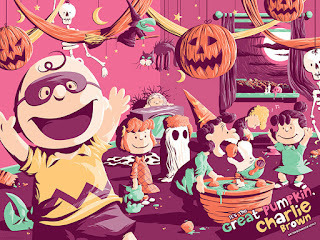 The second print, by Australian artist Florey, focuses on the Halloween party scene from the show. 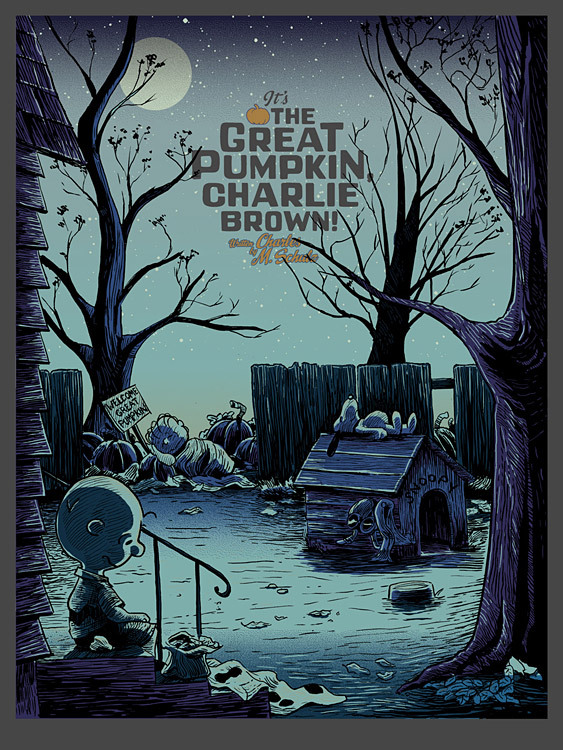 This print will be available in a standard edition and a variant edition with a somewhat different color scheme. All these officially licensed editions will measure 18" x 24"; Tim Doyle & Ridge Room's editions will be screen printed and Florey's editions will be giclee printed. All the prints go on sale Thursday, October 22, 2015 at 9:30 AM Pacific time at Dark Hall Mansion's webstore. They're usually fast sellers, so be ready to act when they go on sale!